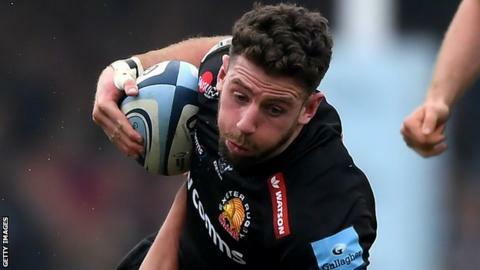 Exeter head coach Ali Hepher has praised winger Alex Cuthbert after his return from injury. The ex-British Lions and Wales back, 28, played his first league game in almost three months against Newcastle - after his second spell on the sidelines since moving to Sandy Park last summer. "He's had a frustrating time with injures, but you can't fault the dedication he puts in," Hepher said. "He's fighting to be fit, he's immaculate in his preparation." Cuthbert has scored two tries in nine Premiership and Champions Cup appearances for Exeter this season. The Welshman, along with fellow wingers Olly Woodburn and Jack Nowell, have missed large chunks of the season with injury, with Santiago Cordero and Tom O'Flaherty impressing in their absence. "When he gets on the ball he gets you five metres and gets beyond the first contact, so that momentum we can live off," Hepher added to BBC Radio Devon. "I would love to have had him fit a bit longer to work on some of the stuff we work on, but he's getting there. "Every time he gets the ball he looks a threat and we picked up some good momentum around him, which was great."